KIXX Martial Arts is very proud to have been presented with the set of scrolls opposite. In December 2013 whilst in Malaysia I asked my good friend Kean Chong for advice on who would be the best person to write a Nan Shaolin Wuzuquan scroll for KIXX Martial Arts Club. He said the scroll needed to be created by a martial arts master and renowned calligrapher. This combination would enhance the strokes and create a martial ‘atmosphere’ to help convey the correct martial sentiment for the display. With that in mind, Chong kindly arranged a meeting with Mr Tan Gianseng from Kuala Lumpur Malaysia. He is a senior practitioner of Shen Long Tai Chi, a teacher of Mandarin and a former school headmaster and well known for his excellent calligraphy. Following an ‘interview over cups of Chinese tea’, he agreed to create a suitable scroll to convey the history and future purpose of KIXX Martial Arts Club. The top scroll: ‘Nan Shaolin Wuzu’ (read from right to left). 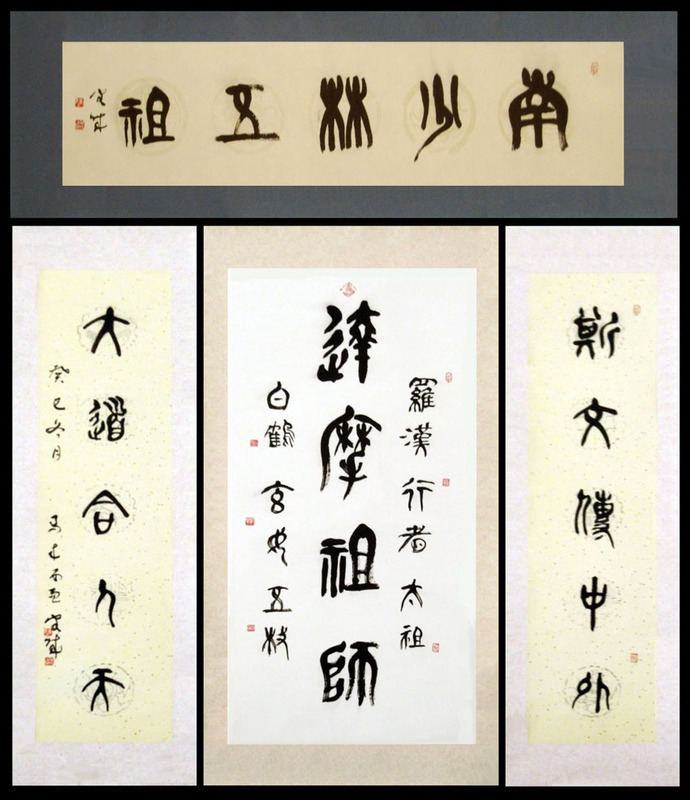 The left hand scroll: A poem about ‘enhancing our style (wuzuquan) and growing in knowledge’ (more detailed meaning on request). The right hand scroll: A poem about ‘ spreading the style (wuzuquan) out of China and overseas’ (more detailed meaning on request). The centre scroll: The Five Ancestors plus Xian Nu and Wu Mei to complete the group (Damo Grand(first)master, Baihe, Xiannu, Wumei, Lohan, Singzhe and Taizu). Chief Instructor of KIXX Martial Arts 7th Dan Nan Shaolin Wuzuquan UK Wuzuquan Team Member (Team Coach in 2010) 3rd Dan Chang Chuen Shu 2nd Dan Shotokan Karate Former British Wushu Team Member for World and European competitions. This entry was posted in Wuzuquan. Bookmark the permalink.